We were at our second classroom (aka local co-op cafe) and just starting our project when a guy comes over and enthusiastically asked, "Can you tell me what you're doing?" 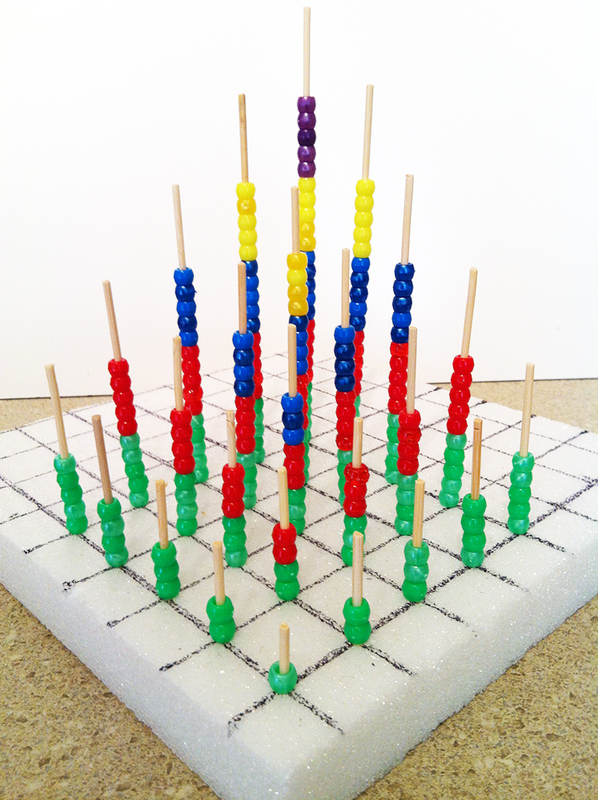 "Oh," said I, "we're building a multiplication tower." 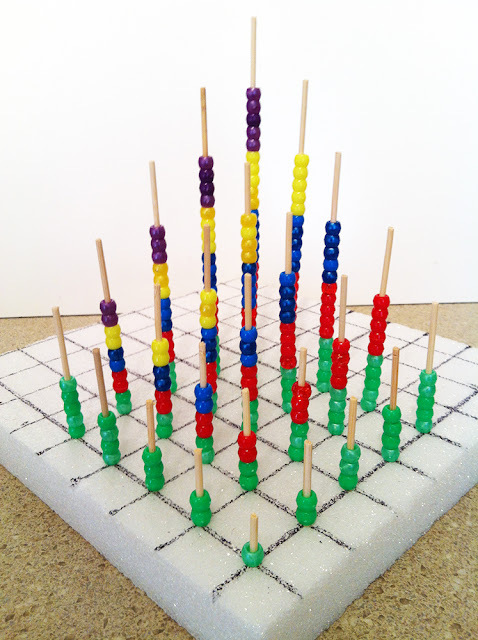 "A multiplication tower? What's that?" "Well, we've got these posts on a grid, and we are going to use different colored beads in different amounts to..."
I was flummoxed, because after some great conversation about multiplication in the comments section of a post of mine from last March, and the aha! moment I had about scale while reading the Ten Times Better book, I know that's not all there is to multiplication. Not at all. I was so flummoxed it was all I could do to reply, "Well, it's also about understanding scale and measurement and rate..."
And just like that he cuts me off and says, "Well, this seems to be a good concrete way to learn addition..." (or something like that) and leaves, obviously much less enthused and impressed than when he came up to us. And that about sums up the collective view of elementary mathematics, doesn't it? Essentially, the message we get is: "There's nothing much to it, just learn your facts and when you get a little older you can do real math [pat on the head]." "What colors should we use? Is that two 3s or three 2s???" It helped to see that the square numbers 4, 9, 16 and 25 moved up the diagonal and it calmed me a little to know that, whatever happened, we weren't completely on the wrong track. It also helped to turn the model and look at it from different perspectives. This is a nice view because you get a linear progression of the colors. On the far left the posts increase by five: 1 five, 2 fives, 3 fives... and on the far right the posts increase by one: 1 one, 2 ones, 3 ones... This, incidentally, is the view my 7 year old prefers, perhaps because it is so orderly. 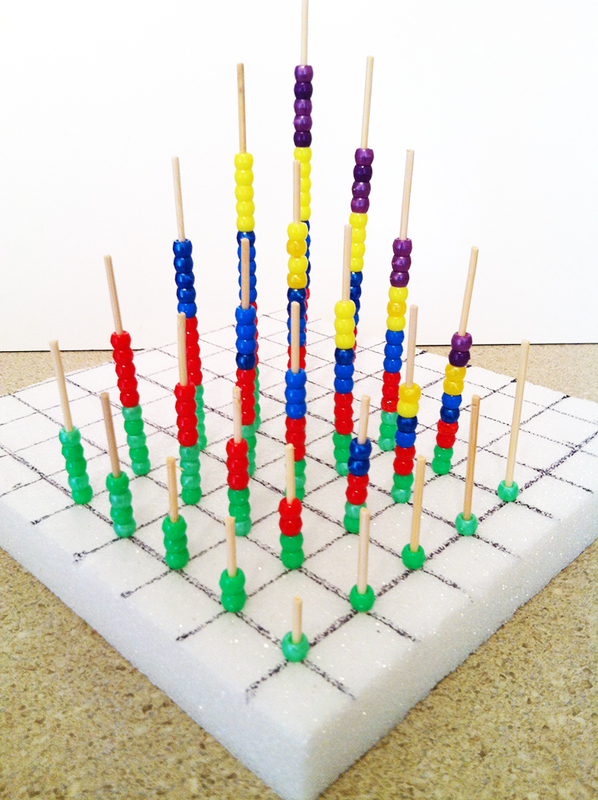 I do absolutely understand in my head that 3x2 is the same as 2x3, but after re-beading the grid/tower it does not seem exactly the same. I mean, look! 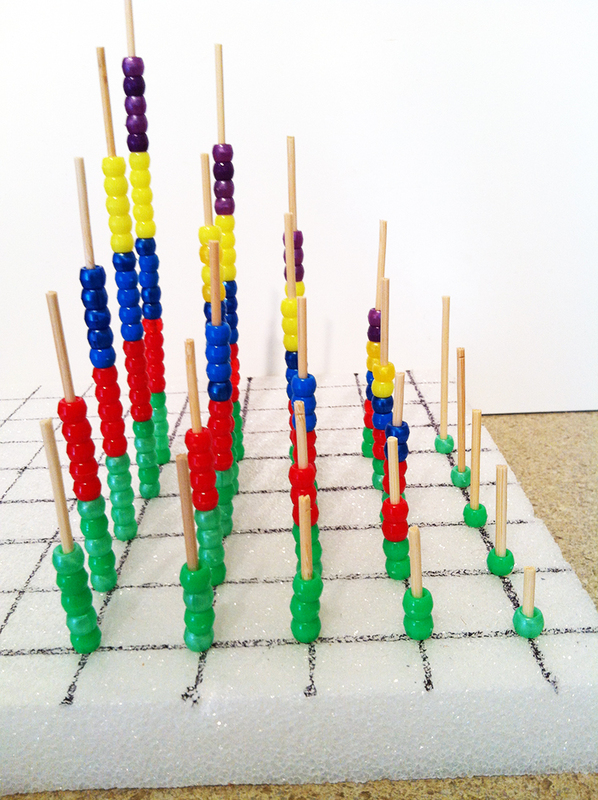 The progression of colors and total number of beads are the same, but the distribution of each color is completely different than it was the first time. Not surprisingly, I had more questions. What would happen if each x column increases by one and was the number rule for the multiples? Essentially, there are only 1s on the first row and the 2s row goes up by 2s, the 3s row goes up by 3s, etc. 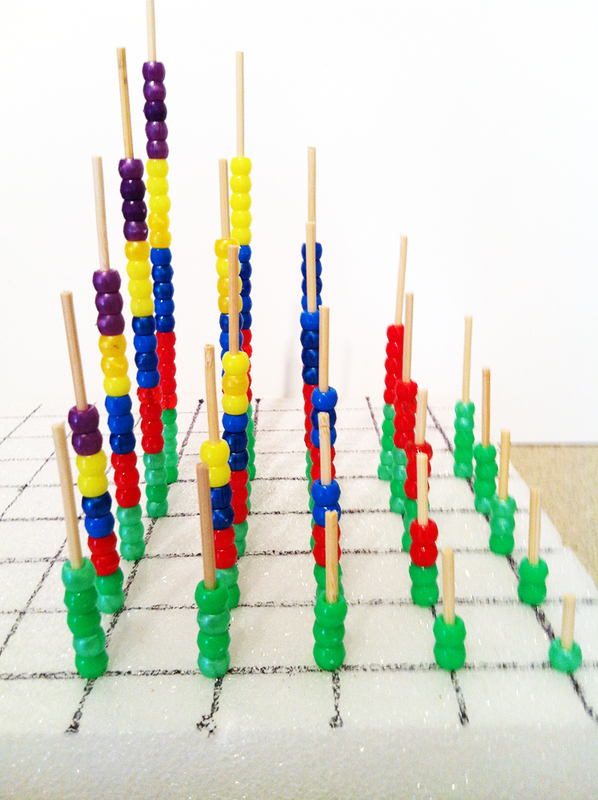 It's a similar result to attempt #2 but the progression to purple now occurs on the x axis! My daughter likes this version a lot, but I'm not so sure. The whole thing is less symmetrical than the others but, on the other hand, there are other things to observe and learn from it that you don't see in the first two. I'm sure there is more analysis I could do, including comparing the total number of beads and distribution of color used in each attempt but that's for another day. My point is, yes, multiplication and addition can be done in any order, but our response should not be 'so what, that's easy, don't forget, let's move on' but rather, "Wow, that is SO amazing!!!" I mean, sure, you get the same final answer no matter what, but just look at the variation in quality. 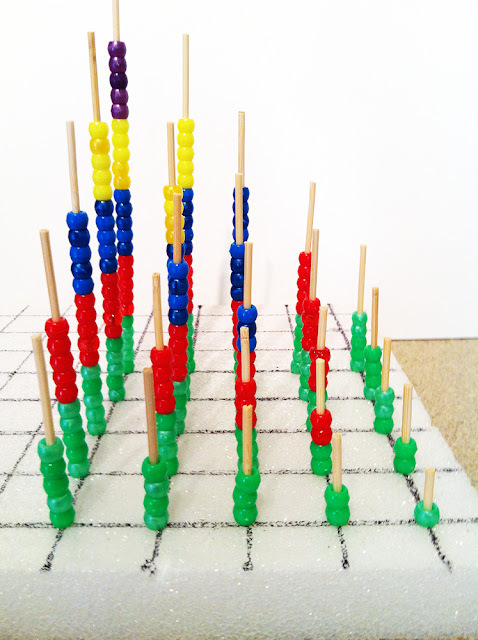 For example, a combination of four 2s (2 green, 2 red, 2 blue, 2 yellow) looks completely different from two 4s (4 green, 4 red). Before I started my personal math remediation, multiplication seemed like nothing more than a table of right answers. Now, however, it seems like a wonderful opportunity to find as many different right answers to the same question as possible. My kid got a little bored with the beading process but no matter. I'm going to leave my favorite version out on display, which will make at least four different multiplication models up in our house right now, for us to ignore or puzzle over as we will. It's already generated some nice conversation about square numbers. p.s. I got inspired to do this project while reading the proofs of the grids chapter in the new Moebius Noodles book. They say the project's target age is birth to age 6 but, using today's activity as an example, I really think anyone can benefit from their playful, hands-on, inquiry based approach to math. p.p.s. I kept the skewers long during the first beading iteration but quickly decided to trim them because I truly could not see the forest for the trees, lol! I think the trim helps focus the eye on the gradient and the patterns produced by the color quantity and progression..
Commutativity is an amazing property. What really strikes me about it isn't so much where it works, but where it fails. For example, while commutativity works for addition and multiplication, it fails for their inverses! (ex. 2+3 = 3+2 = 5 but 2-3 = -1, 3-1 = 1). Even more interesting is that it fails if you continue up the "scale" of operations. Addition is commutative, multiplication is commutative, exponents are NOT commutative. Commutativity is an amazingly deep and non-obvious idea! When I saw your first photo, I thought, "That's a decanomial square!!!" Pythagoras would be so proud of you! I've been making ever-more-complicated permutations of the decanomial square for the past few weeks, as I consider how to best present it to Will. That is amazing! So beautiful, so amazing. Oooh, how wonderful! I am grabbing this (with attribution) for my growing collection of the 3D times tables (which we need to move to Moebius Noodles). Thank you for your inspiring and though-provoking blog, Malke (even though the thoughts it provokes sometimes leave my head spinning, LOL. Like so many parents, I'm learning maths again with my children - properly, this time). I loved this post and pinned it a long time ago. We finally got around to making it last week, hurray - lots of fun and learning! Thank you for all the inspiration. Oooh, that is an awesome post! I love reading about your own personal discoveries as you went along and also how your kids interacted with, compared, and extended the ideas. Just wonderful. My son has been struggling with multiplication. It seems he needs to be able to see what exactly is happening before he can memorize his multiplication facts. This is perfect. I just made this with 1x1 round lego pieces. The only thing I did differently is to add a different color each time as I went up the Y axis rather than have all the same color. It seemed to make more sense. A New Venture for a New Year! When is a 10 not a 10?